The original and still the best option where reliability and longevity of service are important. Used around the world the Tirfor range of cable winches are specified by emergency services and the military alike. 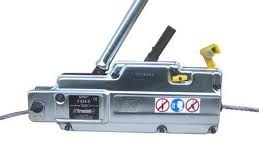 The T5 series is a lighter weight version of the heavier duty TU series, but still manufactured from quality components and is used widely by fire and rescue services, forestry workers etc. etc. When only the best will do the TU series offers a heavy-duty solution to most lifting and pulling applications. As with the T5 series these winches are used the world over by the military and fire and rescue services. Reliable and dependable the TU range will give years and years of continued service.